Here’s a tower defense game with a twist. Instead of defending a fort or treasure, you are now defending your own immune system from virus attacks! 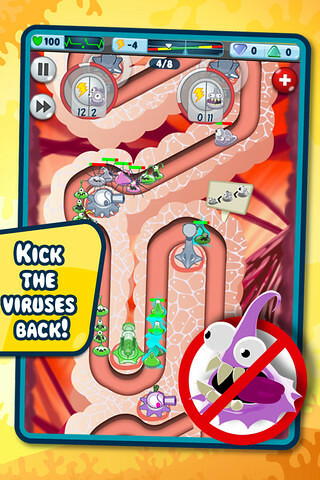 Viruses are attacking your organs in their thousands! 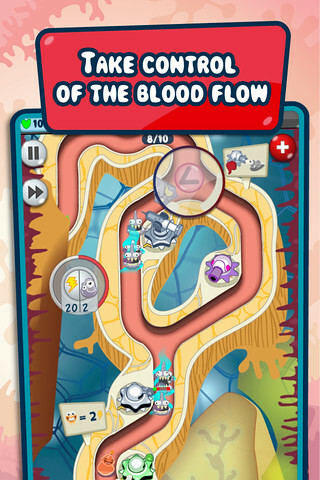 It’s time to step up, build your defenses and control the blood flow in this frantic strategy game of TD fun! THE BEST PLAYGROUND EVER: YOUR OWN BODY! • Heart, muscles, lungs and kidneys: all your organs, in hilarious and colorful graphics, need your help against the viral attack! • Stay alert! The intruders in your blood stream are quick, resistant, and can even replicate, mutating into a total of 15 different strains. • You are not alone. Four fearless guardian towers are there to defend you, each with unique tactical abilities and upgrades. • After the battle, head for the Lab to learn real facts about organs, viruses, the immune defense system and its cells. To build a tower, we need energy and the energy we are talking about are things like ‘carbyhydrates’ and ‘proteins’. These energy travels along the path from the mouth and down. We need to guide them to the construction sites. Unfortunately, the same path is also used by viruses. So you gotta be alert and tap quickly with your fingers!